In the 1990s I went on numerous pilgrimages to an Orthodox monastery in Michigan, usually spending a week there in the tranquil beauty of the evergreens and the angels. 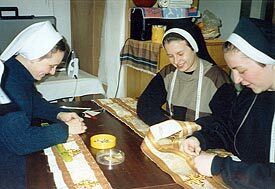 Monastics are sometimes called angels on earth, because they attempt to live the angelic life—strict fasting, long church services, hours of solitary prayer in their cells, all coupled with warm hospitality to visitors and devotion to their physical labors in the garden, the guest house, the kitchen, or the sewing room. The sewing room is where they make vestments for priests. Visitors aren’t usually allowed in there, but one time, when my husband (who is a priest) was with me, I accompanied him to a fitting for a new cassock the nuns were going to make for him. I was fascinated by the quiet industry of the nuns as they worked—especially the ones who were ripping out seams that had been put in wrong. When I used to sew, I would sometimes get so frustrated with my mistakes that I would throw a piece of material away before I would put in the tedious labor of removing stitches. I asked one of the nuns how she could be so cheerful in such a task. She replied with a story about a novice who needed to learn patience. The abbess made her sew a piece and rip the seams out, over and over, just to learn her lesson. Irene Latham’s poem, “The Faith of Spiders,” (in her new collection, The Color of Lost Rooms, which just came out in January of 2011) reminded me of those nuns, working patiently in the sewing room. The shadowed corner which is the spider’s home is also the home of the nun, and perhaps of the writer. Writing, like sewing (and praying) is a lonely pursuit, even when it’s going well. But when the pages are filled with “mistakes”—with clichés and information dumps and scenes that fall flat—the even lonelier work of revision is needed. And for the nun and the writer, learning to do this “without a grumble, not a curse” is quite a challenge. Once I completed the first twenty days of Sleeping With Poets, I crafted a nonfiction book proposal and began to query agents. Within a week I had received two rejections, and so I began to doubt the quality of my prose, and of my query letter and my proposal. I asked for feedback from three valued sources—a poet, a novelist, and a memoir writer. After receiving their gentle advice, I took my seam ripper and began the work of removing the dross. 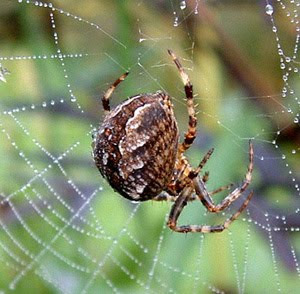 Latham’s poem reminds me, though, that I was the cause of my own problems, whereas the spider’s grief was caused by others. The fly, the wind, and the dog caused the damage to the spider’s web. And perhaps there are flies, wind and dogs running through my writer’s pen when my mind is scattered. Even in the “shadowed corner” where I try to write, my undisciplined mind often allows entry to these damaging elements. The flies—those nasty self-critics spreading their germs; the wind—everyday distractions that blow my pages hither and yon; and dogs—the loud, barking noises of the internet, radio and television, calling me to play with them.